Pablo Iglesias, center, at a Podemos rally in Malaga, Spain, May 17, 2014 (photo by Flickr user cyberfrancis licensed under the Creative Commons Attribution-NonCommercial-NoDerivs 2.0 Generic license). It was the poll that sent shockwaves through the nation. On Nov. 2, El Pais, Spain’s newspaper of record, unveiled what it called a “political earthquake.” Polling data suggested that Podemos, a left-wing party organized only in January of this year, was poised to win the 2015 national elections, besting the ruling, conservative Popular Party (PP), which enjoys a clear majority of seats in the Spanish parliament, and the leading opposition party, the venerable Spanish Socialist Party (PSOE), which last governed from 2004 to 2011. 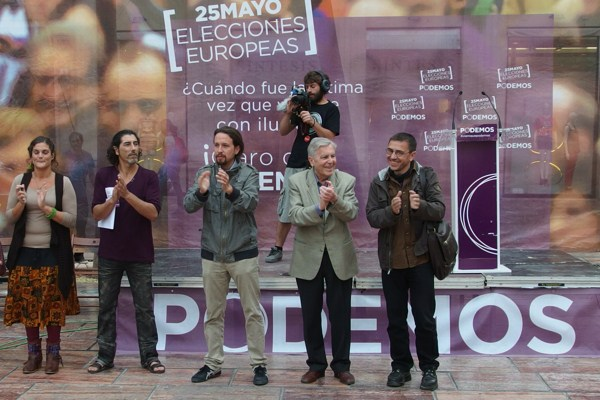 The poll showed that support for Podemos grew from 13.8 percent in October to 27.7 percent in November. Support for the PP dropped from 30.2 percent to 20.7 percent, putting the party in third place, behind the PSOE.